The upper left is the landscape, and the red dot is the current position of the car. 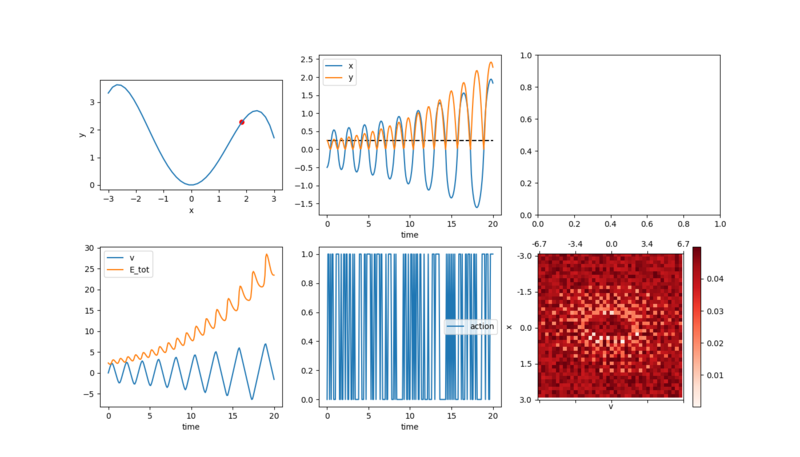 The top middle are a plot of the x and y positions. The bottom left is the velocity. The bottom middle is the current action taken (forward or backward, I didn’t give it a “do nothing” option). 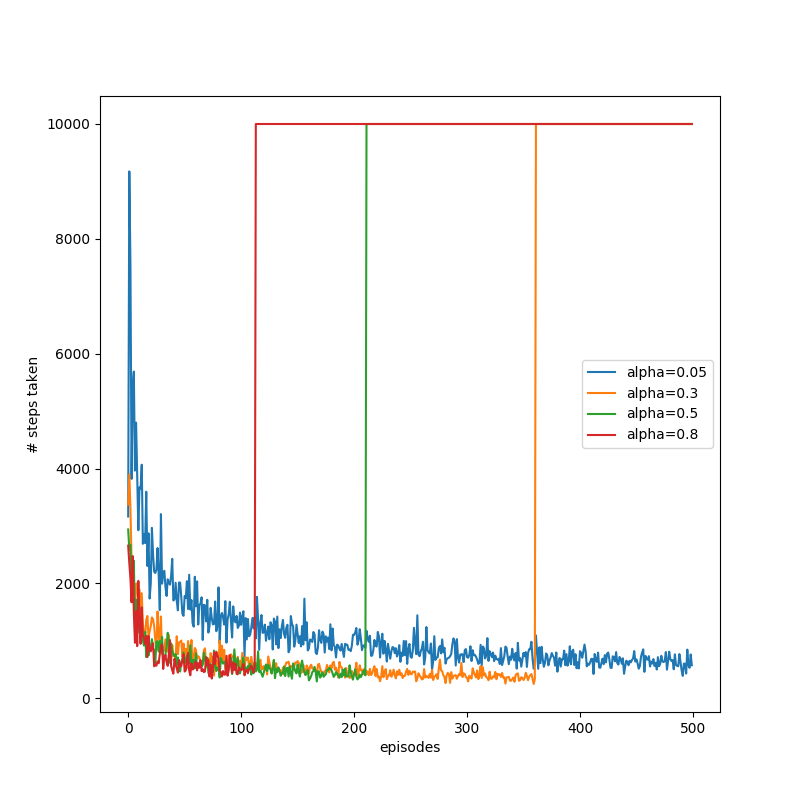 The bottom right is the value function approximation, which I’ll talk about more later. I’ll sometimes put stuff in the top right, but generally don’t have anything in it. About as good as the E-C method with dt = 0.01, but more importantly, it’s losing energy rather than gaining it, which is better. This just adds a bit of a hurdle for us, but at least can’t be cheating. I kind of suspected that what I was doing (calculating the slope at each RK4 point, etc) might be overkill because the differences in the acceleration due to gravity at different points in the same time step are probably negligible, but I guess you can really be pretty loose with it and the mechanics will still probably work out? Oh well. Anyway, now time to implement the RL part! 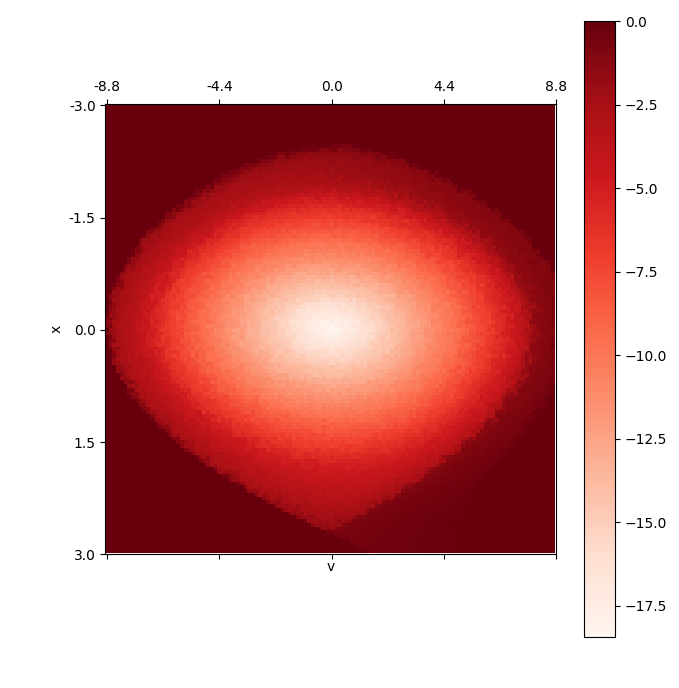 There are a handful of ways to set the problem up, but maybe the most common is discretizing the parameter space to form the feature vector, as also briefly mentioned in the wiki article. The idea is that if you know your x coordinate ranges from [-1,1] and your velocity will always be in the range [-5,5], that marks out a section of the 2D x-v plane. You can then chop this plane up into smaller squares, such that for any (x,v) combo within that section, it will be in one of those discretized squares, which will be the car’s current state. I chose to discretize it in 40 subsections for each dimension, so there are 1600 states. So, the state S is a function of x and v, S(x,v). So, the value function V(S) is a 40×40 array, and the state-action value function Q(S,A) is a 40x40x2 matrix, because there are only 2 actions to take. In reality, I’m actually implementing it so V and Q are each the matrix dot product of a feature vector X(S,A) and a weights vector : , and technically is the thing we’ll be trying to improve. But, this will probably be mostly hidden this time, so don’t worry about it. 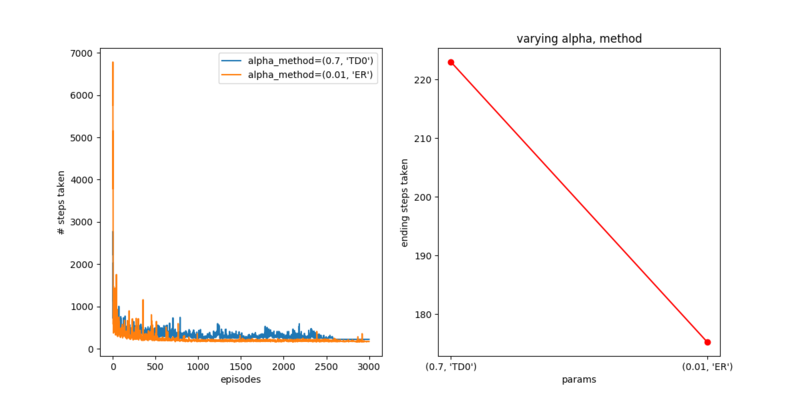 I implemented TD(0), TD( ) (TDL), and Experience Replay using batch gradient descent. I’ll go over TD(0) first. 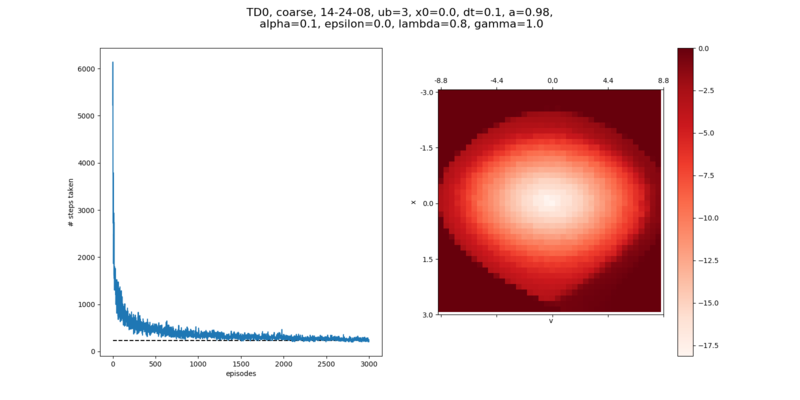 You can see that 1) it takes ~4,000 steps (400/0.1) to complete, 2) it gets pretty far often, and then gets worse, before getting better, 3) the value function is definitely getting a lot of character. 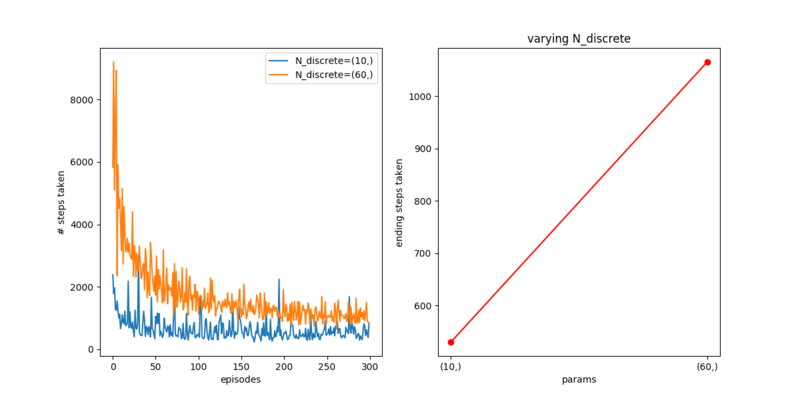 We can then run the same thing, but over many episodes, keeping the value of Q(S,A) we’ve found so far, so that it will use it and continue to improve it. 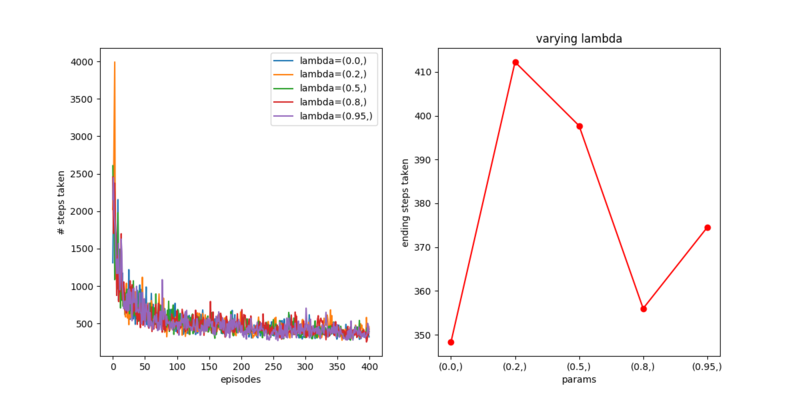 This is a standard way of showing that the system is learning over time, because the steps it takes for an episode to complete should decrease. Now let’s try working some greediness into this. It’s doing fine with total greediness, but maybe if we introduce some randomness early on, it might find better states, or converge faster? 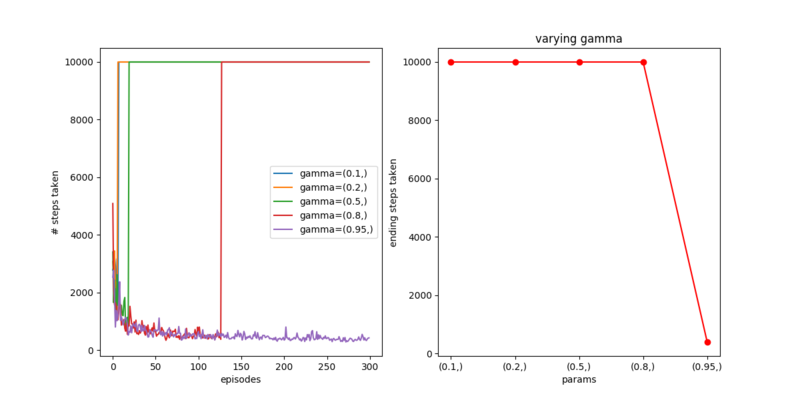 For clarity, I’m not resetting between episodes, which I think makes more sense. Hmm. 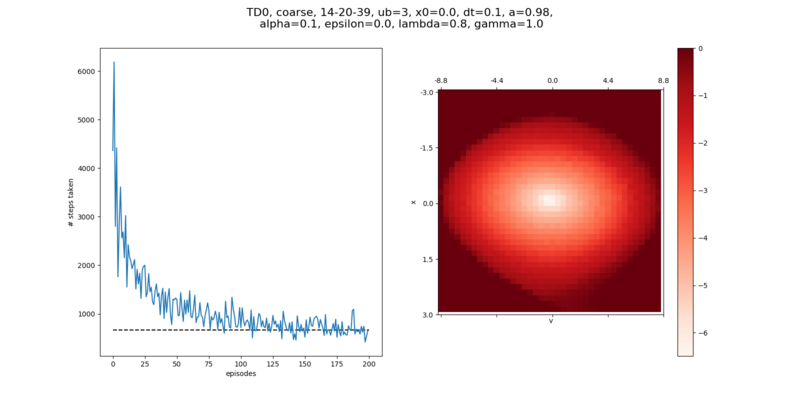 It turns out epsilon greediness doesn’t seem to have a huge effect, at least for the values I tried. 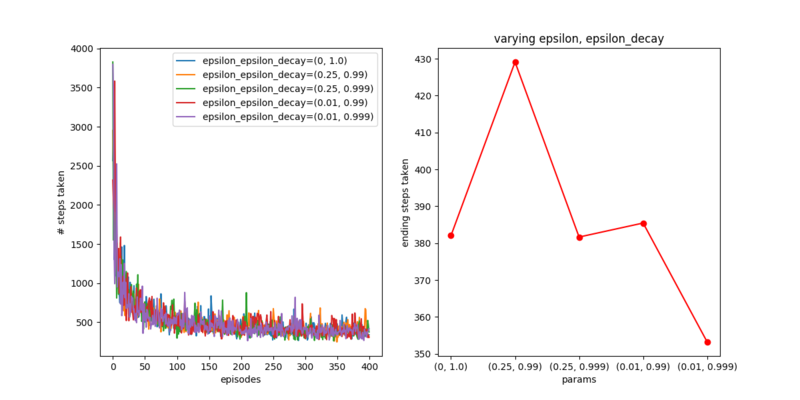 For clarity, epsilon_decay is the value that is multiplied by epsilon every time step to get the new value. 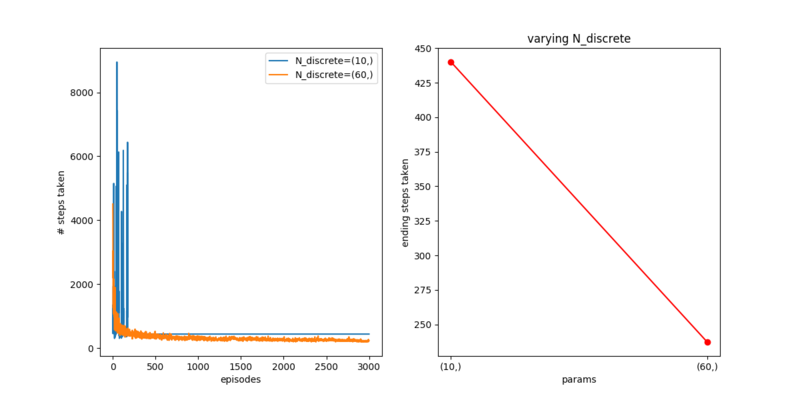 On the right I’m plotting the average of the last 20 points of each curve on the left, to show where they settle. So it seems like it just doesn’t do much here. 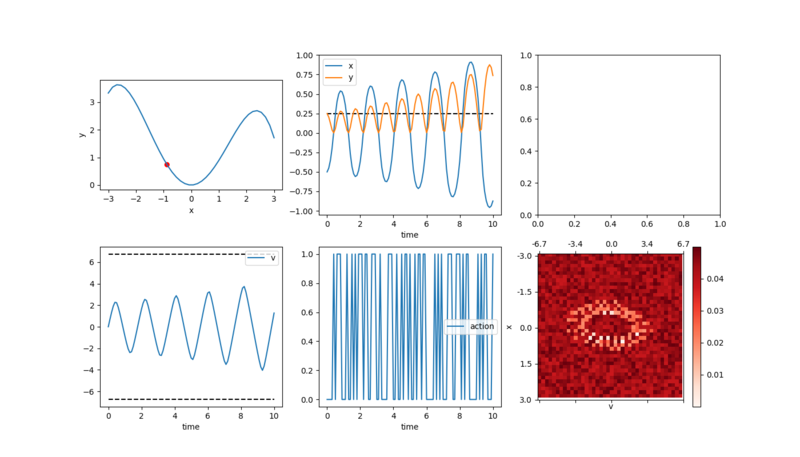 Similar story for this one too, though by this point the differences between = [.2, .5, .8] are probably just due to noise. Weird! How about for 3,000 episodes? So for this, works if it’s low enough, but the combo of “low” (0.8) and a higher breaks it. Hmmm. Let’s look at a few other things. 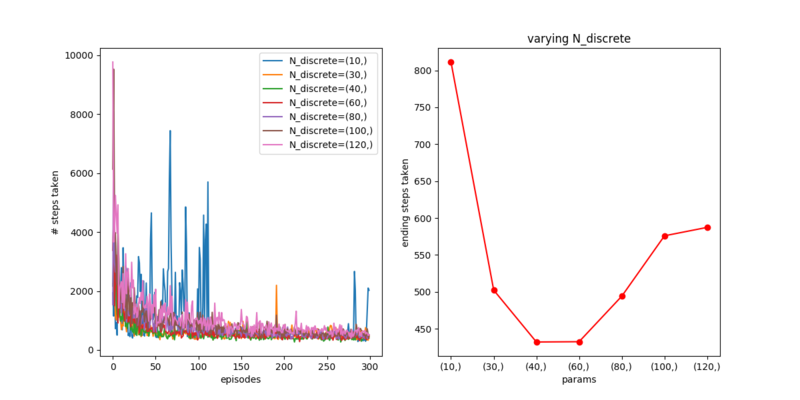 First, something I was curious about is the effect of the discretization size (i.e., how finely x and v are chopped up) in the coarse coding. By default, I was using 40 for each of x and v, but it’s not clear to me how that number would change things. On the one hand, it seems like finer is probably better, because a single entry of the Q matrix will represent a more specific range of (x,v), and therefore be able to more finely tune its behavior to that range. On the other hand, the more finely you dice the parameter space, the less samples each block has, so it will be much slower to learn. 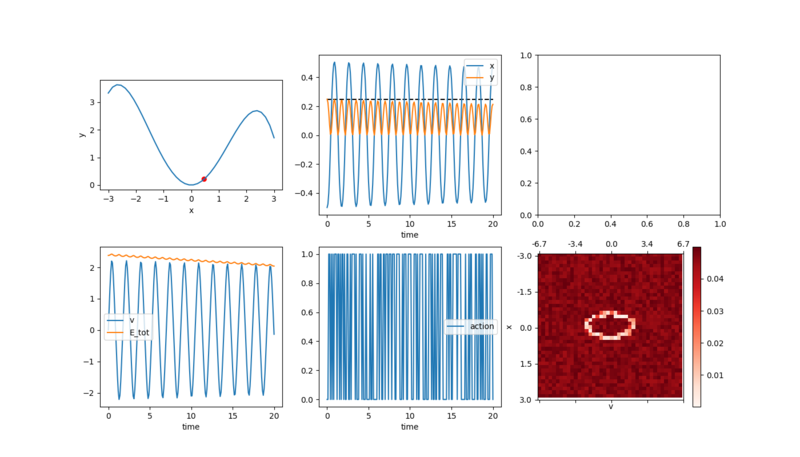 For example, the agent probably should do the exact same thing for the two states (x=-1, v=1) and (x=-1.5,v=1) (i.e., accelerate towards positive x), but if these states are considered different, it’ll have to learn stuff for them separately, which is way less efficient. You can see that for both 300 and 3000, N=10 is just too small to describe the different “states” the car is in, so it never does great. 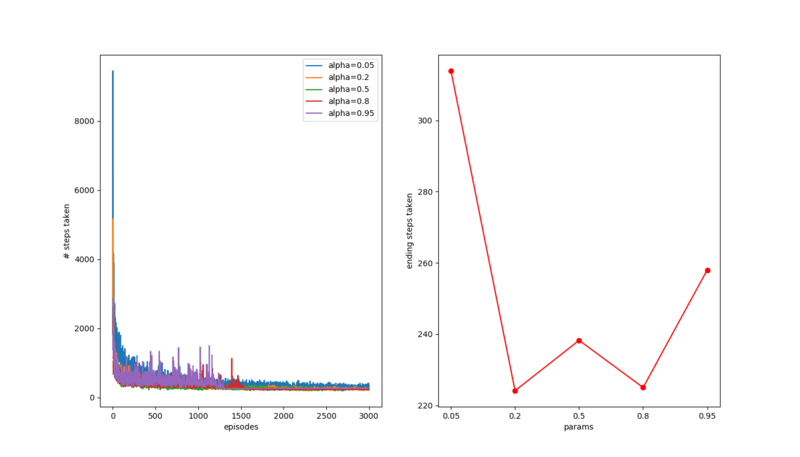 For the higher N’s, like N=100 and N=120, you can see that they don’t get enough samples for the 300 one, so don’t converge great, but with the 3000 one, they get enough samples and are about as good as N=60. 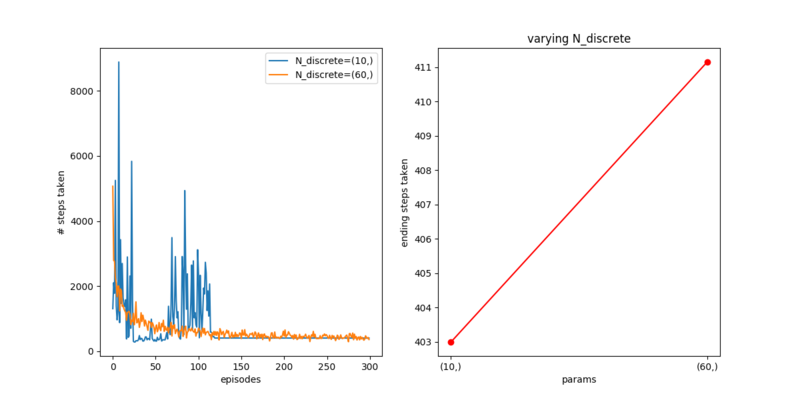 Out of curiosity, I plotted only N=10 and N=60 together, but with the original , but also a smaller . When you do that, this effect is really pronounced! For 300 episodes, they’re pretty much the same. 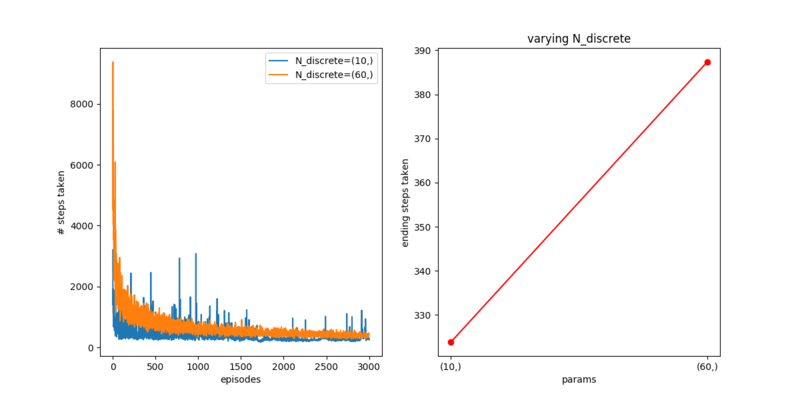 However, after 3000, the N=60 one has continued to improve, because it got more info it needed and was able to use it, while the N=10 one is about the same. Here, you can see that if you try a smaller learning rate, the effect is really pronounced. 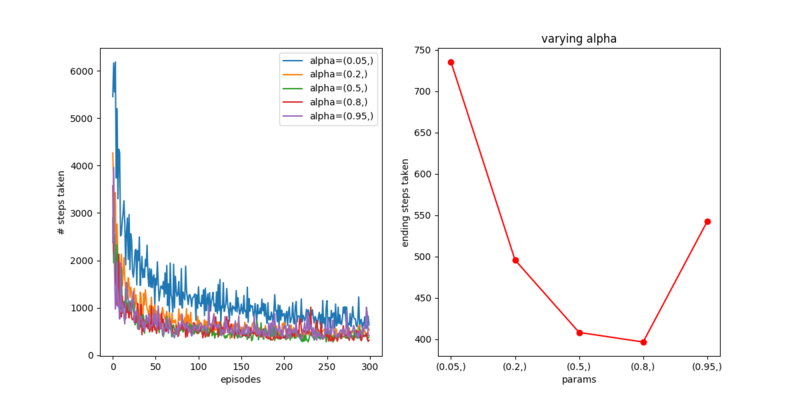 After 300 episodes, N=10 has converged quickly, but N=60 is both getting fewer samples per state, and additionally, the smaller alphas mean that each samples “counts” for less. 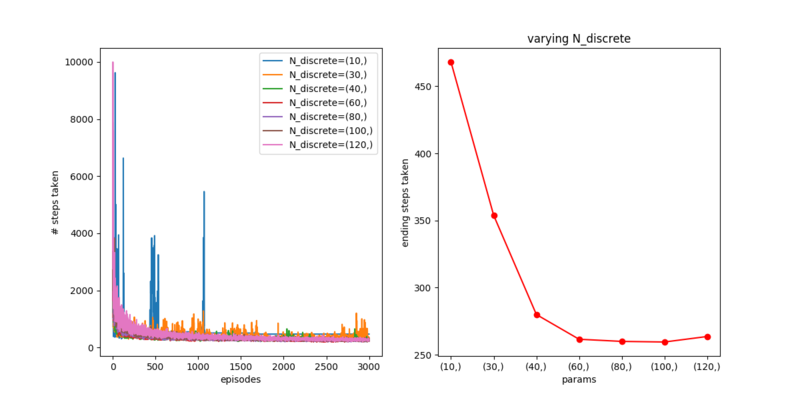 So, even after 3000, N=10 is somewhat better, though it seems like N=60 is still improving. The last thing I’ll talk about today is using Experience Replay (ER), which is a technique used by Deepmind in solving the Atari games. 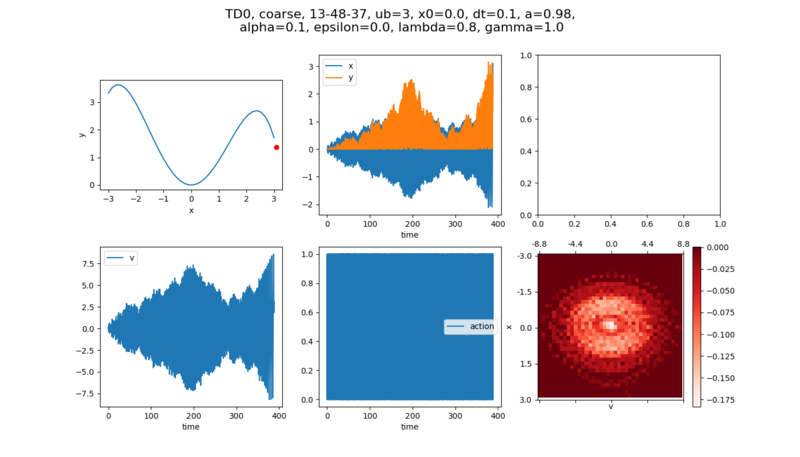 The main gist is that, while the SARSA/TD/Q-learning stuff above basically continually updates Q based on steps it experiences at the moment, ER stores previous steps, and re-samples them again and again in a way that makes it more like a supervised learning problem. In ER, you still choose actions the same way we have before, with -greedy, but each step, also store the “experience” (S,A,R,S’) of that step. That is, for a given S,A, performing action A will give you an R and the next state S’, so you store that whole outcome. In ER, you’ll also actually have two sets of weights, the “old”/”frozen” ones, and the “new” ones, that you’ll update. Periodically (every 20 time steps, say), you’ll copy the new weights to overwite the old ones. Now, to update Q (or rather, its weights), every time step, you take a mini batch (maybe 20) of a random subset of those experiences. You then define the error/loss as the sum over , for all the experiences. Here, importantly, that term means, taking the maximum Q value you could get by choosing the best action A’ in state S’, using the “old” (or, “frozen”) weight values (that’s what the “w-” means). So you use a given experience (S,A,R,S’), but you don’t use whatever A’ you actually chose when that experience happened, you use the best one you could do now, using the current “frozen” weight values. Additionally, in the Q(S,A,w) term, (S,A) are given by the experience, but the actual value Q(S,A,w) is the one based on the current weights (hence the “w”). The main motivation with ER is that you get to reuse data. Typically, in SARSA, you get to learn from an experience once. With ER, because you’re storing them, and a big part of the experience was the reward you got, it can converge faster because it’s using more info at each step. To do this, I’m using pytorch. My weights matrix for Q is now also initialized as a tensor, which very conveniently shares the same memory as the numpy matrix it was originally. I’m using a batch size of 20 (fairly arbitrarily chosen) and an update period of 10 time steps (likewise) for copying the current weights to the “frozen” weights. #So this will be all the Q(s,a,w)'s  for the NEWEST w weights. #Calculate based on the CURRENT Q weights. #Calculate based on the FROZEN Q weights. It’s pretty much what I described above. So how does it do? 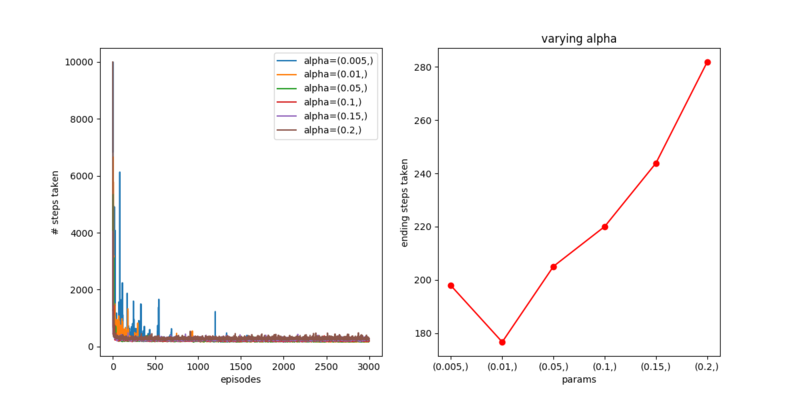 Other plots I did for slightly lower (0.001) and higher (0.22) values make it very quickly blow up, so it seems like it’s fairly sensitive to , and needs a small one. It looks like is best for this. How does it compare to TD0, for its best value? Hot damn! Not bad! 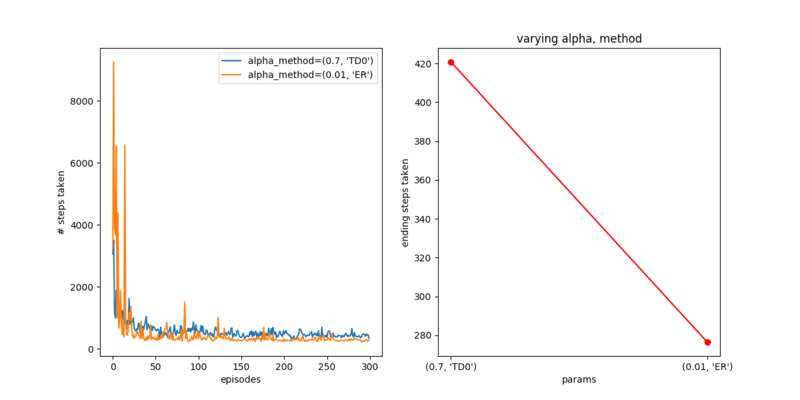 You can see that it behaves better than TD(0) in both the short and long term, getting down to 175 steps in the end. I scanned the batch size and frozen weights update period, too, but it didn’t seem super interesting so I’ll leave that out since this is already long. Well, that’s all for now! There are a few things I’ll want to try in the future, so maybe I’ll come back to this.